For most couples who already had a civil wedding, having a Philippine church wedding seem unnecessary. Some, on the other hand, still wish to commit themselves in front of the Lord and make a vow of everlasting love and commitment. For Seve Barnett Oliveros and Mary Joyce Frias – Oliveros, exchanging vows in a church served as the pinnacle of a 10-year journey as husband and wife. 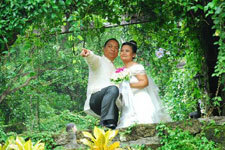 Seve and Joyce’s love story all started with a phone call, a favor for Joyce’s friend. But the first conversation and the others that followed led to a friendship that blossomed into love. But Joyce’s parents were very strict, so they had the relationship in secret. On top of that, Seve went to work in Jeddah, Saudia Arabia, which made things harder for the sweethearts. In time, Seve was offered to extend his employment. Plus, if he was married, he could bring his wife along. It was too good an opportunity to pass up, and at the same time, Seve said that he was afraid that the brewing EDSA 2 revolution would destabilize the entire country into civil unrest. “So I asked Joyce to take me as her husband,” explains Seve. Joyce recalled that it was in the morning of December 15, 2000, her 21st birthday, when Seve, then 24 years old, gave her a small box with three red flowers inside it, and in the card was written, “Happy Wedding Day.” They were married that afternoon at the Manila City Hall, with only Michelle, Joyce’s best friend, knowing that they have tied the knot. They wed without the “ceremony” and just signed the papers. “It was a risky decision, yet shows how carefree and young we were. No regrets though,” reminisced Joyce. Seve went back to Jeddah and the couple continued with their normal lives. Only a few friends knew that they were already husband and wife. “Our families might not be prepared for the troubles and issues the revelation will cause. We love them so much. We just have to hope for the day that we will feel they will be ready enough,” explained Joyce. It was 2002 when Joyce learned that she was pregnant. It was not a healthy pregnancy. She had to stop working as a hospital dietitian. They then decided to finally reveal the truth to everyone. Sadly, the couple lost their first baby. But if it didn’t happen, they would not have the courage to tell everyone the truth. Joyce went to Jeddah with Seve and started their family there. 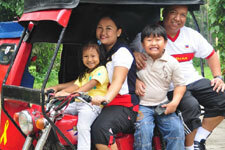 Like in any marriage, there were hits and misses but everything is worth the bumpy ride. And it has been a wonderful ten years. Everyone else – their in-laws, family members, and friends wanted the couple to have a church wedding. Joyce explained that with her Catholic upbringing, she wouldn’t be at peace without the Sacrament of Matrimony. So Joyce kept on bugging Seve, “I want us to experience a “real wedding vow.” It’s every girl’s dream. I wouldn’t care if its 2,4,6,8 years after, I just wanted to experience it.” In addition, her mom and grandmother always reminded her that it’s not yet too late to have a church wedding. But at that time, it was not possible since Joyce got pregnant with their second child, Rinojo (now 7 years old) and was followed by Sophia (now 5 years old). The following years became difficult due to financial concerns, especially when the couple decided to go back to the Philippines in 2006. 2010, however, became the perfect time to renew their vows and have a church wedding to coincide with their 10th year civil wedding anniversary. Seve was fortunate to get a job as Planning and Programs Analyst at King Abdullah University of Science and Technology (KAUST). “Perhaps there is a divine intervention in it. And to borrow how my niece titled our wedding pictures in her Facebook account, the wedding is “much awaited,” said Seve. Joyce, now working as part-time administrative assistant at KAUST school, added, “In celebration, we will be exchanging vows this time in church, with the blessing of everyone we love.” She thought that the church wedding would be a breeze. “But it was so hard to relax after all the years of anticipation. Yes, I still felt like a new bride … still nervous and excited,” shared Joyce. Of course, Joyce’s mom, as if she was the bride, was overly hyper, excited and stressed. She was the busiest and hands on with the preparations. When it come to planning their wedding, “I wouldn’t decide though without asking Seve’s opinion on it. So it was a mixture of ideas and concepts of the three of us,” said Joyce. Meanwhile, Seve designed and created the invitation. He was also the one who mixed and matched the colors of the table and chairs cover and banners at the reception. On August 7, 2010, precisely nine years, seven months and 23 days since they went to Manila City Hall, they profess their love for each other once again. This time, they stood in front of a priest, not a judge; inside Antipolo Cathedral, not a courtroom, and in front of their family and friends.